Finding the right connection between your hands and the golf club can be one of the greatest challenges in golf. That’s why Ben Hogan is famous for saying, “good golf begins with a good grip”. Consequently, finding the right glove to augment your grip of the club also can’t be underestimated. Your hands have to be able to feel the club long before you can even start building a stance. You certainly don’t have to wear a golf glove, as there are no rules requiring such equipment. In fact, some top players, including former world No.1 Fred Couples and 2009 US Open Champion Lucas Glover, chose to play without gloves. However, a golf glove provides a level of tackiness that makes holding onto the club much easier. This allows for decreased grip pressure. If your grip of the club is too tight, it can restrict your ability to set and release the club: both important factors in a successful swing. It’s also a primary reason why Ben Hogan would recommend to, “grip the club as if you were holding a baby bird”. Golf gloves are also beneficial when dealing with the elements on a golf course. Changing weather conditions including heat, cold, wind and rain can affect the tackiness of a golf grip. Losing control of a club can be downright dangerous, making the right golf glove essential. Whether you play just a few times a year or multiple times a week, a golf glove can be important in protecting your hands from blisters. With 70-100 swings a round, it’s easy to see how quickly your hands can show signs of wear. I’ve worn a golf glove my entire life and frankly wouldn’t consider playing without one. My left hand does not feel comfortable taking a full swing without a glove. Since I’m fortunate enough to play and practice quite often, I go through a few gloves each year. This also allows me the chance to test all kinds of gloves to see what my favorite components are of each. Recently I tested an innovative new leather glove from a company called Mokom that is quite impressive. 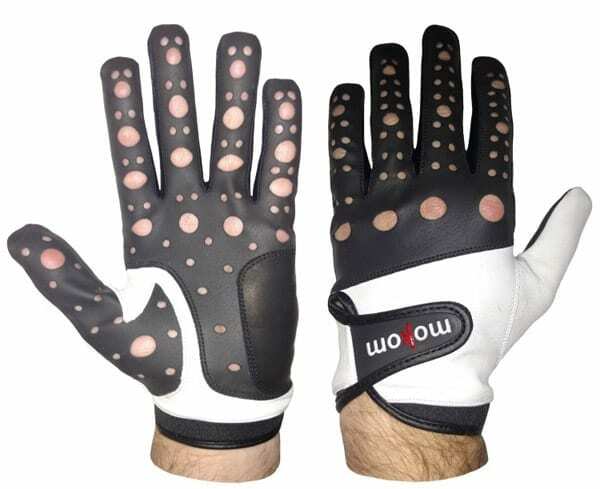 The prominent feature of the Mokom golf glove is a precision laser cut hole pattern for strategically exposed skin. This hole pattern provides exponentially improved tactile sensitivity because your skin is in direct contact with the club much more than a traditional glove. However, your still have the tacky benefit of high quality leather against the club. This combination of feel and consistent grip allows for better touch, resulting in decreased grip pressure. An important factor in the strength and stability of this glove is the black textured polyurethane coating on stretchable polyester knit fabric. The high quality materials used by Mokom allow a unique design like this to work. Lesser materials would certainly impact this type of design. Another feature that I appreciated was its solid and firm structure. The glove has a high degree of structural integrity that is comparable to most full leather gloves. It’s easy to put on and easy to take off. I was afraid the Mokom glove might be a bit flimsy from the hole pattern and the large knuckle openings and numerous air ventilation holes. However, that simply was not the case. The extra durable leather palm pad and strong double stitching construction within the Mokom glove have held up well after ten rounds and twenty range sessions. This is a durable glove that works well in all conditions. I tested it in 90 degree heat, rain and even in 40 degree cold. The Mokom glove worked extremely well in all three. In fact, this glove out performed nearly anything I’ve played with in difficult conditions. My handgrip, tactile sensitivity and manual dexterity improved in moisture and cold conditions that typically adversely affect most other gloves. The Mokom glove is an innovative solution to one of the most important challenges in golf. The innovative design provides tackiness, feel and durability that can’t be beat.